Spring has arrived with a flourish of poetry events in Hobart. A new seasonal poetry reading at Hadley’s Hotel on 26th September will feature James Charlton, Philomena van Rijswijk and Megan Schaffner. 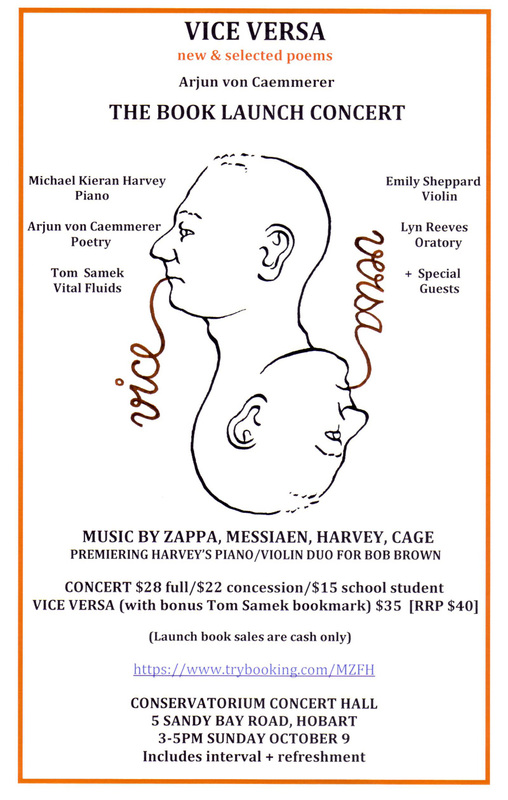 Vice-Versa, a book launch concert at The Conservatorium of Music on 9th October will celebrate the release of Arjun van Caemmerer’s latest poetry collection, with music by Michael Kieran Harvey (piano) and Emily Sheppard (violin). I am delighted to be launching this impressive book. Published by Collective Effort Press, Vice-Versa represents twenty five years of von Caemmerer’s diverse and engaging writings across a range of subjects and styles. The afternoon promises to be an exciting and memorable event, full of surprises. One of the many highlights will be the premiere of Harvey’s piano/violin duo for Bob Brown. The regular monthly Republic Bar & Cafe readings will be held on 2 October (3-5pm); and the Bruny Island Bird Festival (October 14-17) will include a Poets’ Breakfast with Pete Hay as MC and readings from Sarah Day, Adrienne Eberhard, Karen Knight, Liz McQuilkin and Jane Williams. This entry was posted in All posts, Books, Events and tagged poetry. Bookmark the permalink.